Fig. 1: 1927 Rolls-Royce Phantom I with Ascot Tourer coach work, on view at Port Royal Circle, Winterthur Museum. Winterthur, set on 980-acres in northern Delaware, is charged with the management, preservation, and interpretation of over 850,000 objects in the museum, garden, and library collections combined. But there is only one antique at Winterthur you may see driving around the grounds: an American built 1927 Rolls-Royce Phantom I. To those not familiar with the world of luxury cars in the early twentieth century, one must first understand that a chassis built by an automobile company—the framework and drivetrain—was commonly fitted with a body of the owner’s choosing constructed by another firm. This was the age of custom coach building that came out of the carriage trade and thrived until the Great Depression and advancing technology made custom coach work all but obsolete. A coach built body could be removed, replaced, or re-fitted to a new chassis as the owner wished. Winterthur’s Phantom I chassis (S 379 FM) was built in Springfield, Massachusetts, by Rolls-Royce of America, Inc., with a 1929 Ascot Tourer body crafted by Brewster & Company of Long Island City, New York1 (Figs. 1, 2). Fig. 2: Detail of Winterthur’s Rolls-Royce Phantom I build plate (S 379 FM). Henry and Rebecca Lapham of Brookline, Massachusetts, took delivery of this Rolls-Royce in 1928 fitted with a Lonsdale limousine body by Brewster. Around 1933, it is presumed that the Laphams replaced the limousine body with the more sporty Ascot Tourer coachwork, which came from another Rolls-Royce Phantom I originally purchased by George Baker Jr. in 1929. Philip C. Beals took possession of the car in the late 1940s preserving it in the condition that it is in today. The family of Mr. Beals donated the car to Winterthur in 2008 where it evokes the style of the country place era in America when Winterthur was in its prime for entertaining. Scientific analysis of historic objects and art work begins with non-destructive testing, i.e. with no material removed from the object. X-ray fluorescence (XRF) spectroscopy of the metal components of the car corroborated compositions known through catalogues and oral history and aided in the care and treatment of these components. 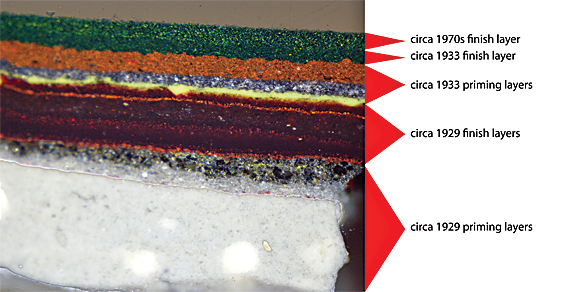 Cross-section microscopy, which analyzes a minute sample, was used to discover the paint history of the vehicle. The Cross sections elucidated the presentation colors of the automobile throughout its ownership and complicated history of changing the coachworks on the chassis. Fig. 3: Cross-section photomicrograph at one hundred times magnification of a paint sample from the ash frame work of the body. The circa-1929 first generation of paint shows three white and gray primer layers followed by nine finish layers that are black, red and maroon in color. The final appearance was black in color. The circa-1933 paint layers contain three priming layers and one green-colored presentation layer. A single green paint layer was reapplied in the 1970s and is the current green paint seen on the automobile. One sample, taken from the ash framework that supports the aluminum panel between the driver’s side front and back doors, provided a full paint history of the coachwork. The circa-1929 first generation of paint on the Ascot Tourer body was black in color. The cross-section photomicrograph shows nine layers of black, red, and maroon paint applied to achieve what originally would have been a deep, glossy and saturated black finish. This color coat is on top of three white and gray primer layers. The twelve layers in this paint generation functioned to protect the car body from the elements. The second generation of paint on the coachwork includes three primer coats with a single dark green-colored finish layer. This green may have been applied circa 1933 when the Ascot Tourer body was first put on the 1927 Phantom I chassis. A second, single layer of dark green paint was applied in the 1970s to match the earlier color. Research and analysis of the materials used in the vehicle’s construction and its eighty-plus years of operation will continue. Winterthur maintains the vehicle in operational condition as the best way to preserve and interpret this historic object. 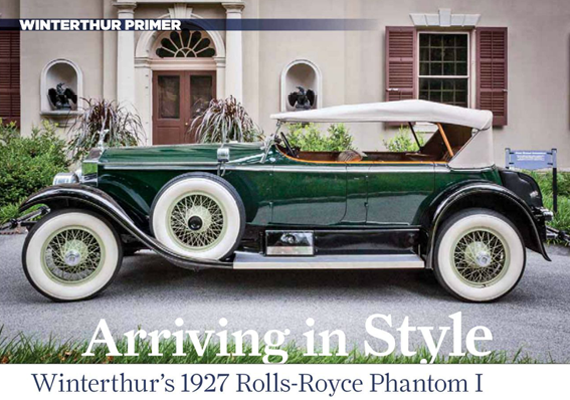 When you visit, you may see this American Rolls-Royce on the roadways at Winterthur and the nearby countryside harkening back to a time when many of Winterthur’s guests arrived in grand style. 1. Rolls-Royce Limited, a British company founded in 1906, established a manufacturing facility in Springfield Massachusetts, in 1920. The Rolls-Royce Phantom I series followed the Silver Ghost and was introduced in 1926 with approximately 1,150 built in the United Sates before production ceased in 1931. 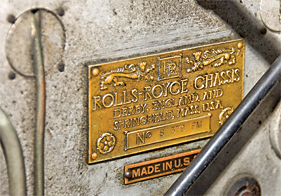 To secure superior coach work in the United States, Rolls-Royce purchased Brewster & Company in 1926 where many of the American built Rolls-Royce bodies were fabricated. The Springfield built Silver Ghosts and Phantoms are the only Rolls-Royce chassis ever built outside of the United Kingdom. 2. For commentary about ethical considerations in the care and treatment of historic automobiles, see Fred Simeone, ed. The Stewardship of Historically Significant Automobiles (Philadelphia, PA: Coachbuilt Press, 2012). 3. See related study: Mark Anderson and Gregory Landrey, “Treatment Protocol for a 1929 Phantom I Wood Body Rolls-Royce Automobile,” in Wooden Artifacts Group Postprints 2005 (Washington, DC: American Institute for Conservation, 2005), 37–46.